Keep an eye on your followers with your PiTFT! It must have been at least a year since I bought my Adafruit PiTFT. At that time I was reasonably new to the scene but couldn’t resist buying what looked like a micro flat-screen TV for my Raspberry Pi. What followed was a lot of disappointment. 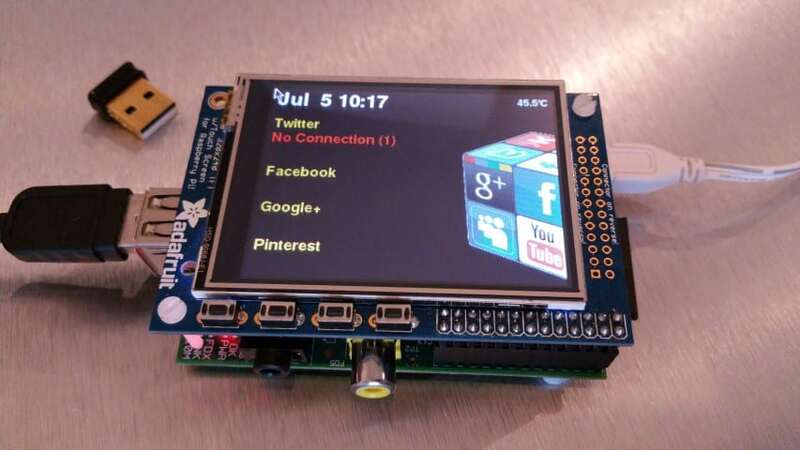 Being a Raspberry Pi novice, I assumed this little GPIO-connected display would be ‘plug n’ play’ just like any other HDMI monitor. It’s not quite that simple…as many will know. I found the screen difficult to use and couldn’t see any real usage for it – so it went to the back of the cupboard. 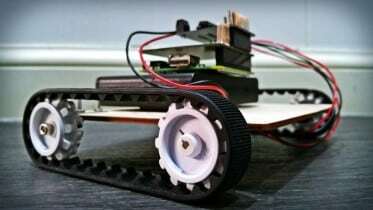 Zoom forward 12 months and I’m slightly more educated on the Raspberry Pi, and have the confidence to try my hand at more difficult projects and code. I recently decided to return to the PiTFT to try something similar to MrUkTechReview’s Internet Radio – using PyGame to make a nice graphical display with buttons and all sorts of magic. Having already made an internet radio, I had a good think about what would be a useful project for me – to warrant having my display on show in the house at all times (regardless of the wife’s stroppy protests). 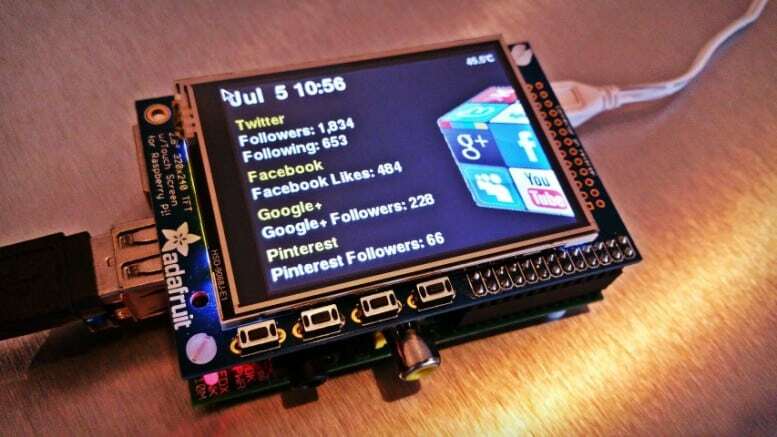 A project was born – I would make a Raspberry Pi PyGame social network monitor! I have a few different social networking accounts, and whilst it’s not really that important, I like to keep a check on the number of people following or subscribing to me on these networks. There’s something exciting about having thousands of strangers follow your every move! Whilst I can check my various apps for this information, I thought it would be cool to have a little Raspberry Pi on display showing the stats that I’m interested in. Twitter, Facebook, Google+ and more – data from most websites is easy to display. My first hurdle – I didn’t have a clue how to make any kind of GUI (Graphical User interface) or display on the PiTFT. A lot of people said “Oh just use Tkinter it’s simple” or “PyGame is really easy just give it a go“. These people do not understand us ‘Average’ folk. They don’t appreciate that we work 9-5 office jobs, have relationships to manage, weight problems to ignore and still think that Python is a snake. We are the reserves of the coding world – weekend warriors who don’t usually remember the function or command they learnt the week before. 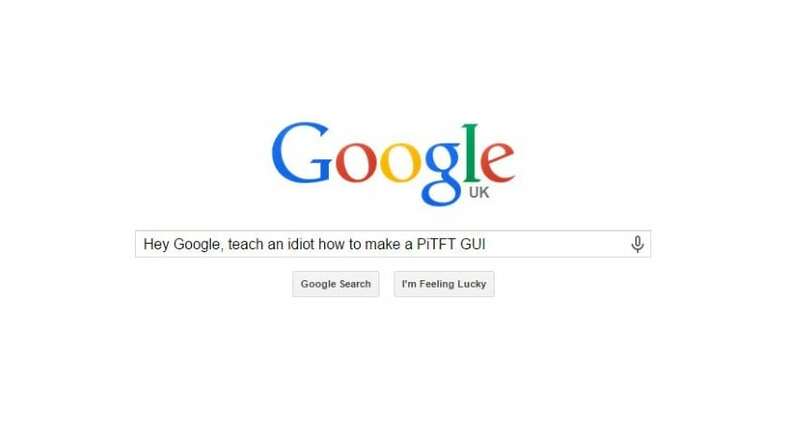 If you search Google for a PiTFT GUI, you’re likely to come across the two main contenders – Tkinter and PyGame. I’m not even going to touch on Tkinter – I had little luck finding any tutorials or guides for that, at least not any pitched at a simple enough level for me to understand. PyGame seems to have a bit more in the way of supporting materials and examples, but it’s still not an easy thing to grasp at first. I struck gold when I came across MrUkTechReview’s basic sample code for PyGame with the PiTFT. Spencer has kindly uploaded a Python file to DropBox to help get people started, and this is exactly where I kicked off. Looks basic enough, the code must be short and simple…right? Not quite. PyGame wasn’t instantly obvious to me, so I had to spend some time working out how the code worked. I took Spencer’s menu example and slowly worked out what each line or block of code was doing, why it was doing it and seeing what happened if I changed or removed it. I’m a bit funny like that – I’m never happy unless I know what’s going on in a Python script. This is why I like to comment my Python files to death. I’m sure many would frown at my code commenting style, but it works for me. After working out how PyGame works with the PiTFT I started working on my own display, which eventually turned in to my Raspberry Pi social network monitor. The idea all started after seeing a Kickstarter Tracker tutorial over at RasPi.TV that looked into a Kickstarter page source code, chose the specific info it was looking for (funded rate etc) and printed it in terminal. I had an idea to do something similar, but instead of Kickstarter I would direct my code to my social networking profiles to pull back the counts of followers and subscribers. The monitor checks my social networking accounts every 45 seconds and updates the follower/subscribe count for each of them. It also shows the time, date and the Pi’s temperature, as well as a nice little image on the right hand side. So…how did I make it? I’m going to take you through my entire Python file, step by step. That’s what I would have liked to have found when I was trying to learn, so I hope this is useful to someone, someday! The full code won’t fit on the page due to the wide indentation, so download and open the PasteBin file in your favourite text editor to follow along. I use NotePad++. The code pasted in this blog has very few of the original ‘#’ comment sections included. I really recommend reading the full comments in my Python file as you follow this, they’ll help answer any questions as we go along. Also, you shouldn’t need to install anything as the packages being used should all come with Raspbian. After the imports there are a few lines that are required to get the PiTFT working. Anyone who has messed around with this screen before will recognise the ‘fbdev’ or ‘fb1’ parts and will know that this is related to getting the PyGame to show via the GPIO rather than HDMI (I think!). A single line here that initiates PyGame. I’ve been told that nothing will work if you don’t include this. Here all we’re doing is setting up a font and font size that we can easily refer to in the code later on – rather than writing a full line to set the font each time. The name of this is…you guessed it…’font’. I make other fonts later on with different names. Usually with these PyGame/PiTFT projects you would want to have a number of buttons or icons to click on. For these to work, you have to set the areas of the touch screen for each of these buttons. In this project, I’m simply setting the entire screen as one touch button, so that wherever you click you will trigger the exit script to close down my monitor screen. Either way, you do this by setting two line coordinates on X and Y to make a right-angle, and then Python completes the shape to make it a rectangle. 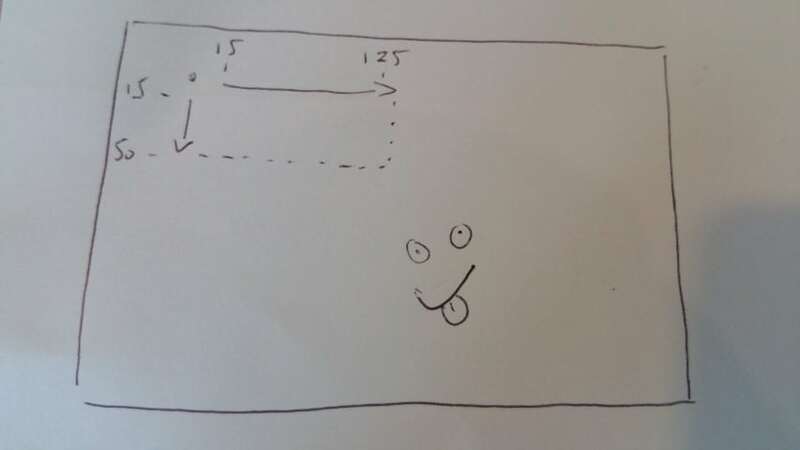 This code first says “Make an invisible line from 15 across to 125 across” (X axis). That’s the first part (the X axis) before the “and”. It then continues to say “Make another invisible line from 15 down to 50 down” (Y axis). The first coordinate of both of these is the top left point of your angle (In this case 15,15). All references are ALWAYS from the top-left. 15-125 across, and 15-50 down – simple! Anyway, here is the next section of my project code using this method, again, mine is using the whole screen. When you do click the screen, it will trigger ‘button(0)’ which we will come to. When your set buttons are clicked, you need to have a module of code like this to tell PyGame what you want it to do each time. This is what this section does. We referred to ‘button(0)’ earlier on. We trigger ‘button(0) when we touch the screen, so here we’re defining the action to take for my one and only button (close PyGame using ‘sys.exit()’). We kind of repeat a set of actions 3 times here, for no reason other than to emulate dots moving across the page. After this short wait, we do this again twice, but with an extra ‘.’ each time, before finally exiting the GUI with the final exit command (line 114). print "User requested to close GUI"
Quite a simple step here – we’re just adding RGB colours into our script to use elsewhere for things like label fonts, borders and backgrounds. I used the Colour-Hex website to find RGB colour codes. The following lines simply give you a black screen with the text “Loading” showing, just for the fun of it (nothing is really loading whilst this shows on screen). You could delete this part and the main monitor would still work. The code is split into 3 parts (just like the shutdown section above), which are all identical apart from the text being displayed. Part 1 shows “Loading.”, part two shows “Loading..” and part three shows “Loading…”. Notice the dots after the word? I leave a 0.3 second gap between the parts to make it look like a proper ‘Loading’ screen. This is the main part – the code that turns our PiTFT into a social network monitor. It’s the code that adds all the text, data and images you see on the screen. It’s the light in your saber, the cheese on your pizza, the caffeine in your coffee! Our while loop will run over and over and over until we tell it to stop, but we don’t want or need it to update the count of social followers every few seconds. That’s overkill and would slow down my home internet quite considerably. To make sure it only runs every 45 seconds, we add a little code to check the time against our variable ‘timelastchecked’. As we set ‘timelastchecked’ to initially be zero, this if statement will run the first time straight away. You will also see on line 200 that I turn ‘timelastchecked’ into the current time + 45 seconds. This means when it runs through the loop (takes a few seconds) and then tries to run the if statement again, it will need to wait for the time to be greater than or equal to ‘timelastchecked’ – which is 45 seconds ahead of time – giving us a 45 second delay. 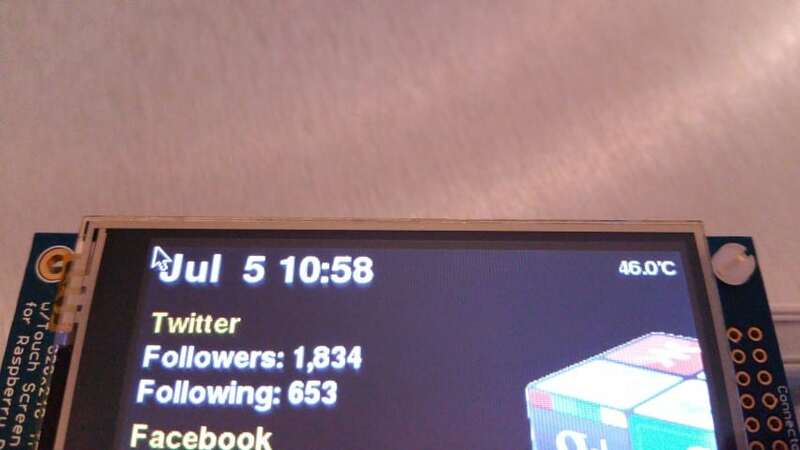 A number of things on my social network monitor are static i.e. they don’t change, move or do anything. These are things like the image on the right and the gold title headings. As the PyGame screen refreshes every time our while loop cycles, we add these elements each time. There’s probably a better way of doing this, but this worked for me. Now that we have the temperature line saved as ‘f’, we now use this to show the Pi’s temperature on screen. Next we add the time and date to the screen. This works in the exact same way to the temperature above – run a command to grab a line of text (the date and time command), then set this as a string, manipulate and blit to the PyGame screen. This part, in a way, is similar to the temperature and time sections above. I say this because all we’re doing is looking at a URL, finding and reading a specific line, then manipulating that line to show as text on screen. Yes there is more code involved because we’re reading URLs rather than simple terminal commands, but the method is similar. What follows is a section of code that makes our little monitor capable of handling errors – and the most likely error of it not being able to read the URL (WiFi or router down etc). What we don’t want is the GUI to crash out just because the internet was down for a couple of minutes. To do this, we use the try statement here. Any errors with the URLs/netwrok will show like this, instead of closing the program. A nice trick learnt at RasPi.TV. Whilst the URL method of reading a line and stripping characters is similar to the temperature and time examples above, with this approach we have a whole web page of lines to look at – so we narrow this down by telling the program to look for a certain string of text in the web page and return only that line. Of course for that to work properly, we need our line to have a unique string of text within it – otherwise we will pull back multiple lines. I looked at both of the lines, searching for a specific string of text that could uniquely identify one of the lines only. I found that ‘ Followers”‘ (with the space at the front) did this perfectly. This is the ‘else’ part of our try statement i.e. the happy path if there are no errors. else: # "If there are no errors"
This theme of pulling data from social networks continues in the while loop, as further nested ‘if’ statements running in exactly the same way – just with different URLs, different unique string identifiers and a different number of characters chopped off each time. Hence – I won’t talk through the remaining social network data ‘grabs’ from line 326 to 442 – it should be quite clear what it’s doing now. Drop me a comment below if you get stuck. Lines 428-442 are purely for debugging, something I took from MrUkTechReview’s sample code. I may have changed this slightly but it’s more or less the same. This section helps when you need to troubleshoot any iffy behaviour, by printing the touch screen press locations to terminal, and also painting them to the PyGame screen. There’s also a section of code here that gives you a safe exit option if needed. It doesn’t look much, but this little line makes sure the PyGame GUI updates. …and that’s it! Code done! It seems the Google+ source code changes almost by the hour (if not more frequently), so where I cut an exact amount of characters from the front and back of a line, it can cause odd characters to show up, and even chop off some of the numbers that I wanted to see. A good way of dealing with this would be to leave a few non-numeric characters either side of the follower count, and use some kind of Python magic to extract just the numbers from the string. I’ll be looking into that. Similarly, if you went from a 3-digit follower count (999) to a 4-digit (1000) – you would need to change the code as you’ll probably be chopping off the 4th character. Again, I wan’t to find a smarter way of doing this. 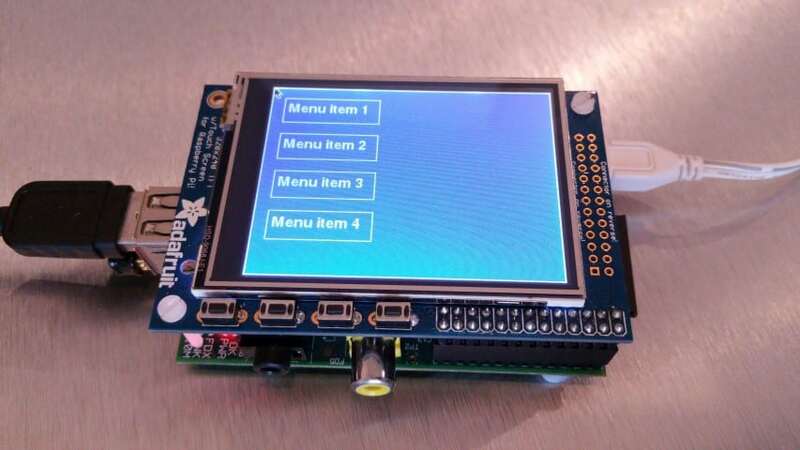 There’s also the issue that the touch screen becomes unresponsive when the while loop is running, but that’s not an issue for this project as it’s intended to be interacted with much. This is yet another project that I avoided for far too long, but I’m glad I finally got my head around PyGame. The best thing about this, is that the same methods can be used to pull data from any website – gamer stats, news, sport scores – anything! I hope this post has helped you to get started with PyGame. If you have any questions, please add them in the comments section below. 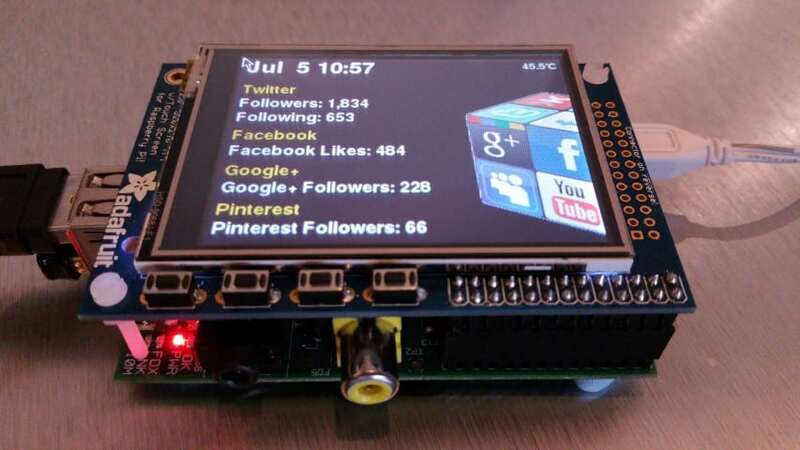 12 Comments on "Make A Raspberry Pi PyGame Social Network Monitor"
Thanks! This will give me so much help with my RPi-PiTFT plans! Although the code works, it can be improved. All the various data collections (temp, date, twitter, facebook, g+, pinterest) can start at the same indentation level. They do not have to be nested as you did it. using the break statement. See https://docs.python.org/2/tutorial/controlflow.html section 4.4. – Same for Facebook (lines 340-367). Should also moved left to indentation level of temperature. Break the ‘for line in fblikes:’ loop when ‘Likes:’ has been found. – Google+ and Pinterest same thing for indentation and breaking the for loop. Code will be more readable (not so wide, since much less indentation at the end) and it will execute faster, decreasing the cpu load. PS Keep up your commenting style, It sure will help beginners. Thanks a lot Ton, lots of things for me to think about there and will help my other projects too. I get a bit hung up with loops, I always seem to nest and nest and nest into eternity! I’ve got a lot to learn about Python still – all the little tricks. What did you name this .py file? I think my final version was called “socialmediamonitorupdate2.py”, but that’s a terrible name. So I guess I’ll call my version “socialnetworkmonitor.py”. Why do you ask? When someone does a project. EVERYTHING should be included! Guess I’m old school. You young bucks ASSUME to much. Are you referring to the python file name? I didn’t include that because it makes no difference to this project. You could call it ‘shoppinglistfortuesday.py’ and it would make no difference at all? I’m not that good at coding… Anything, yet. So for now i give. Do you know where I can purchase an sd card for my pi2b, or where I can download media server stuff to run Netflix, I came up with a decent mount for the back of my big screen powered by the TV, HDMI to the tv, rii wireless rii x1 keyboard and a wireless dongle. Also a couple large thumb drives for storage. Now I just need to set up Netflix and copy a few movies. I just bought it and have high hopes. Please help or redirect. Hi Ed. You can get a micro SD card (you need a micro card for the Pi 2 B) at pretty much all the good Raspberry Pi stores, Amazon, eBay (careful for fakes), Maplins etc. Everyone is selling them these days. Same with thumb drives. Netflix won’t work on the Pi, not directly and in any kind of clean way anyway. I heard some people messing around with apps to stream what is showing on their PC screen to the Pi, but that’s surely going to be a horribly clunky experience. perhaps this helps some of your readers:with the raspbian jessie, the TSLIB support is broken, so pygame get’s wrong readings from /dev/input/touchpanel, although things like ts_calibrate and ts_test is working perfect. Thanks Torsten. I don’t know about you but I always search comments for answers so this is bound to help someone.